Fuses wry, literate observations about the world with the snarl of barroom rock. —NPR. 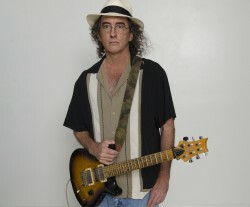 Widely considered one of the finest songwriters of his generation, James McMurtry’s song stories teem with workingman’s angst. His colorful characters—painted with deep sensitivity for the human condition—are usually downtrodden and lovelorn, sometimes funny, and often violent. His band pounds out highly melodic Texas-flavored roots rock that is at times tender and meandering, sometimes bold and scorching. His reputation as a great lyricist—vibrant vignettes packed with sharp sociopolitical commentary—often overshadows his guitar virtuosity. Born in Fort Worth and raised mostly in Virginia, he’s been playing guitar since age seven. His first national recognition came with an award at the 1987 Kerrville Folk Festival, followed by a recording contract with Columbia Records, where he recorded his classic initial trio of albums. In 1996 he signed to Sugar Hill Records and created an important body of work that rivals Texas peers Steve Earle and Townes Van Zandt. His latest is Complicated Game, which captures one of America’s greatest songwriters at the top of his game. Big thanks to Bank of Oklahoma for sponsoring the day’s activities.